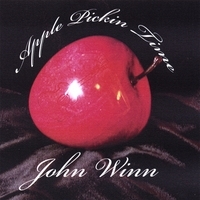 Modern troubadour John Winn has a distinctive finger-pickin' style with influences from folk, Bob Dylan, mixed with his own distinct songwriting abilities. Singer, songwriter, guitarist, folk singer, artist, and humorist. All of these words describe John Winn, a multi-talented man grounded in music, with a life-long love of skiing and mountains. Born near Hannibal, MO in 1934, Winn grew up in the heart of the depression. A high school teacher identified his strong tenor voice and encouraged him, and he studied voice at Culver Stockton College in MO and performed with the municipal opera in St. Louis, MO. In the early 1950’s, Winn’s interest in skiing brought him to Summit County, Colorado, where he found work at Ski Tip Ranch near Arapahoe Basin. In 1954, while serving in the US Army in Fort Carson, CO, he picked up a guitar and started a life-long love of the instrument. After the Army, Winn headed back to Ski Tip Ranch, where he learned to teach skiing at Arapahoe Basin, playing guitar and singing to guests in the evenings by the huge stone fireplace in the lodge. He also began performing in coffeehouses and bars such as the Red Ram in Georgetown, CO, Mike’s Pub in Boulder, the Exodus and Café Les Tarot in Denver. Encouragement from fellow folk singer Judy Collins and her manager led to a gig at Folk City in New York City, and an eventual move there in 1960. He played old English folk tunes in New York City coffeehouses in the Lower West Village such as the Gaslight, Folk City, and Café Lena in Saratoga, New York. A recording contract never materialized for Winn, and he missed the mountains. His love of skiing eventually pulled him north to the state of Maine, where the rural lifestyle better fit his background and personality. He spent 16 years working at ski resorts and performing music on the side. One rainy day in March 1982, with the powder snow turning to spring slush, Winn headed back to Colorado. He taught skiing at Keystone, CO and continued performing in Central City, Black Hawk, and Denver. For the next 20 years, Winn spent time in Winter Park, CO, Angel Fire, NM, Durango, CO, and Silverthorne, CO, where he worked in the ski resort industry. He was the Assistant Ski School Director at Angel Fire, MN, and head tennis pro at Copper Mountain, CO. He also studied guitar with both Rene Heredia in Denver and Hector Garcia in Albuquerque, NM and continued to play guitar in restaurants and for private parties and weddings. He is now performing again in regional concerts in Colorado, including Swallow Hill Music Association in Denver, Steve's Guitar's in Carbondale, Blue Sage Center for the Arts in Paonia, the Western Colorado Botanic Gardens in Grand Junction, Starr's Guitars in Cedaredge, the Avalon Theater in Grand Junction, and the Fruita Summer Concert Series in Fruita Colorado. John has continued to write music throughout his career, and he now has four CDs of his original songs and finger-pickin' style guitar.